I’m not gonna’ lie, typing up the Top 10 Manliest Man Moments in movies list really took a lot out of me. Part of me wants to say I never want to explore the depths of MANLINESS again. Fortunately, the other, less fruity parts of me forced me to spend my first day free of the MANLIEST MAN MOMENTS list inevitably trolling the internet for more MANLINESS. That being said, I really don’t have anything substantial to write about at the moment, so you guys’ll have to make due with the results of my search. More stuff I haven’t seen… Having trouble getting off the manly binge though, huh? Not especially. Creativities’ just kind of burnt out is all. I’ve been writing 3-4 hours a day for the past 11 days on a project that was laid out and planned long in advance, and now that it’s all behind me; my day-to-day post creation abilities seem to have atrophied. I’ll be back on my feet soon enough. How’s your blogging going? Seems like you’ve built up a pretty decent head of steam lately. Yeah, please swing by my site and leave a comment or two if you get a chance. The story’s coming along well and I even have my Heromachine images up there now too. If creativity’s low, maybe we should try some sort of collaboration? Someone to bounce off of could help. Do some sort of series that posts alternately between our sites? Sean looked much better in Time Bandits. Agreed. 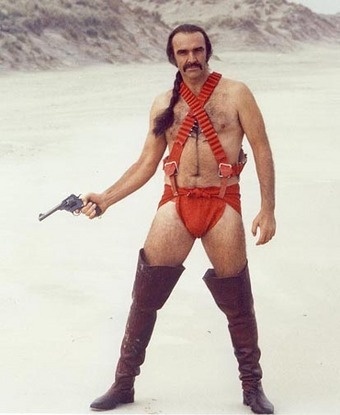 But few can argue the world is not a happier place with yet another Zardoz reference.